Ollie Pinner is hoping to mark his 300th Boston Town game with three points away at basement side Wellingborough Whitworths. The Poachers will travel to London Road looking to push their unbeaten run to five matches at the expense of the United Counties League Premier Division’s basement boys. Pinner was due to mark his milestone at former club Holbeach United at the weekend, only for the contest to fall foul of the conditions. 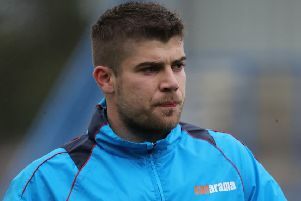 “I think to play 300 games for any club is a great achievement and great credit to a player to have remained loyal to that club for that period of time,” said Town boss Gary Edgley. “But also, to have been playing at this level for that period of time, as well as still being a force at that level, great credit should go to Ollie. Pinner was handed his debut as a teenager by Bob Don-Duncan in a 1-1 draw away at Wootton Blue Cross in August . If selected on Saturday, Pinner will join an elite crew of players to play 300 times for Town. Lee Rippin is way in front with more than 600 appearances, while Matt Price, Ross Don-Duncan and Lori Borbely have all played more than 400 times.